Just two images in this post. The first one show that some areas are sanded as well they show some surface imperfections. Most important is that model get canopy over it as well the same kit is under preparation to be painted. What I did not use is the few of the small parts as well they would be damaged during the polishing process so they will be fit at the very end. Another image show basic coat before aluminum spray- White Base, this is one of the great Gunze Sangyo product. It is very good coat for every paint and excellent for the metallic. Does the Gunze white allow you to paint lacquer-based finishes on top of it? I like the overall finish it gives and would like to try it on my project. As I know it allow use of the enamel based paints but if need I can make some additional test, just let me know type of paints you use as well type of thinner. To regret my bottles of the Testor polishing metalizers has expired and as well it is not easy here to get replacement so easy, I decide to use classic enamel based Testors based paint. This is very good series of paints and I know that many modelers prefer their use. Before I have coat the kit with this paint, which need no polishing, I have dry sand whole surface with sand paper of Swiss manufacturer SIA, which is excellent product. I use 1600 grit and it is excellent to remove any dust or any other agents which is merge to the surface. After smoothing of all surface I have spray paint. Result as well images of products are here. If the "thinner" has dried up in your Metalizer products but there is a lot of the solid pigment still in the bottom of the bottle you may be able to use lacquer thinner to re-suspend the pigment. I've been forced to use lacquer thinner to revive a couple of bottles with good success. Good to know- thank you Only good thing in this case is that I have use material which is also available so this fit somehow to the topic. I'm thinking of dusting off a 1/72 Tamiya P-47 that I started years ago so I can actually contribute to this thread. If only I knew where I stored it! 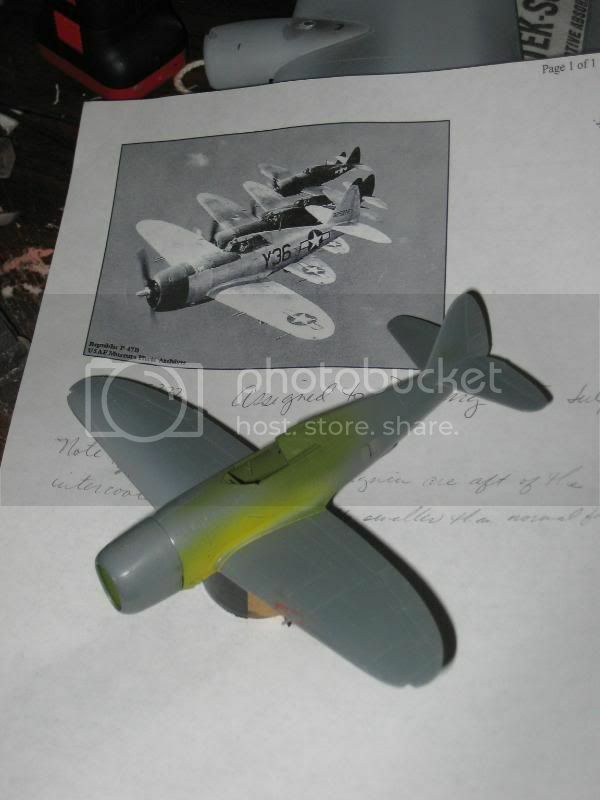 I found my P-47 and it is raining all weekend, so I may get a start on this project tonight and tomorrow. I'll be building the NMF airplane in the photo, a D that was assigned to Bruning Army Air Field in Nebraska as a training aircraft. Ellen and I have spent many hours walking on what remains of Bruning AAF so this model will be a connection to our home state. It's hard to see from the picture, but the Jugs have only two guns per wing for training purposes. This is interesting subject! What is the cowling color? The most interesting thing about the markings on this P-47 is that the factory painted the national insignia on the fuselage too far aft to put the standard ETO squadron codes on. Notice that the forward bar of the insignia is not painted onto the intercooler exhaust doors but is completely aft of the doors. This pushed the aft bar so far back that no letter could be applied. The insignia was repainted on combat aircraft, I don't know if it was done in-theatre or at mod centers. I also don't know if all the factories applied them this way or not. As I know this is not the first case of this offset markings position. This is what modeling making mo' interesting What is the serial on tail? Y36 was a P-47D-20RA built at the new Republic plant at Evansville. The serial is 43-25372. One interesting thing about the Thunderbolts assigned to Bruning was that they got a lot of "oddballs". They had Curtiss-built Gs and the second prototype of the bubbletop variant ended up as a trainer there. I can't decide if the small red panel just behind the cowling is truly red or fresh olive-drab to match the rest of the anti-glare panel in the photo. I'm thinking it was a replacement part in green, but I may use the red as you've done it. These training airplanes were flown very hard and the maintenance crews were faced with shortages of spare parts. The Base Historical Records tell of not being able to get parts and tires because priority went to the combat zones first, then CONUS training stations. Bruning nearly had to cease flying for a short time because no tailwheel tire inner tubes could be gotten.